Successfully Added Smart LED Motion Sensor Light - 5 Meter 120 Degree Sensor, Up To 100,000 Hours Lifespan, Weather Resistant, 23 Lumen, 18 LED to your Shopping Cart. Soft 23 lumens white light to lighten up hallways, closets, bathrooms, cellars, etc. 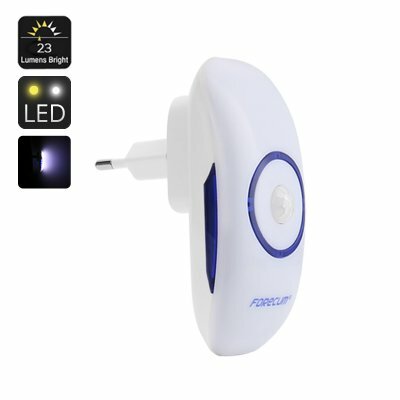 This compact LED motion sensor light is a small yet powerful LED that lights up instantly when motion is detected. The perfect addiction to any household – this LED motion detection light offers the optimal solution to effortlessly light up corridors, bedrooms, bathrooms, the basement and anywhere else you need convenient lighting. Covering a 120 degree angle this LED light activates automatically when motion is detected within a range up to 5 meters. In order to save energy this smart LED motion sensor light emits a mere 23 lumens of soft light, enough to light up the room yet it won’t blind you. Additionally this environmental friendly LED prevents itself from activating during daytime, ensuring that the light will only be activated when really needed. Once the LED light has been triggered it will remain on for 18 second after the last movement has been detected, allowing you to enjoy instant lighting whenever you need it. Installing this LED motion sensor light couldn’t’ be easier. Simply take the light out of the box and plug it in a power socket that is located in the area of your property where instant lighting is needed. As this smart LED light is weather proof it can literally be used anywhere a power supply is availed. Use it to instantly light up your wardrobe, hallways, bathroom, basement or even outside in a tent or on your porch, due to is durable design this led light can be used at any place. Having a stunningly long operating life of up to 100.000 hours this compact and easy to install LED sensor light will last for decades. Simply plug in the LED where ever lighting is needed and you are set to enjoy its convenient lighting for years to come. As this smart LED light is not attached to any mount but rather uses a power socket you can easily change the LED’s location when ever needed. Environmental friendly, cheap, and convenient, this LED motion sensor light is the perfect solution to bring intelligent lighting to any room or office. This LED motion sensor light comes with a 12 months warranty, brought to you by the leader in electronic devices as well as wholesale LED lights and gadgets..
Arabic: - كشف الحركة الصمام الخفيفة - Chinese Simplified: - 运动检测 LED 灯 - Czech: - Světlo LED detekce pohybu - Danish: - Motion Detection LED lys - Dutch: - Motion detectie LED licht - French: - Voyant de détection de mouvement - German: - Motion-Detection-LED-Licht - Hebrew: - נורית LED זיהוי תנועה - Hindi: - मोशन डिटेक्शन एलईडी प्रकाश - Italian: - Motion Detection LED luce - Japanese: - モーション検出 LED ライト - Korean: - 모션 감지 LED 빛 - Malay: - Lampu LED pengesanan gerakan - Norwegian Bokmål: - Motion Detection LED-lys - Romanian: - Motion Detection LED Light - Russian: - Движение обнаружения Светодиодные - Spanish: - Luz de LED de detección de movimiento - Thai: - ไฟ LED ตรวจจับการเคลื่อนไหว - Turkish: - Hareket algılama LED ışık - Vietnamese: - Motion Detection LED Light.